After Brexit, Uncertainty Over Status Of EU Workers Living In U.K. : Parallels Much of the United Kingdom's economy relies on European labor. After the U.K.'s vote to leave the European Union, what will happen to millions of EU residents who now work in the U.K.? 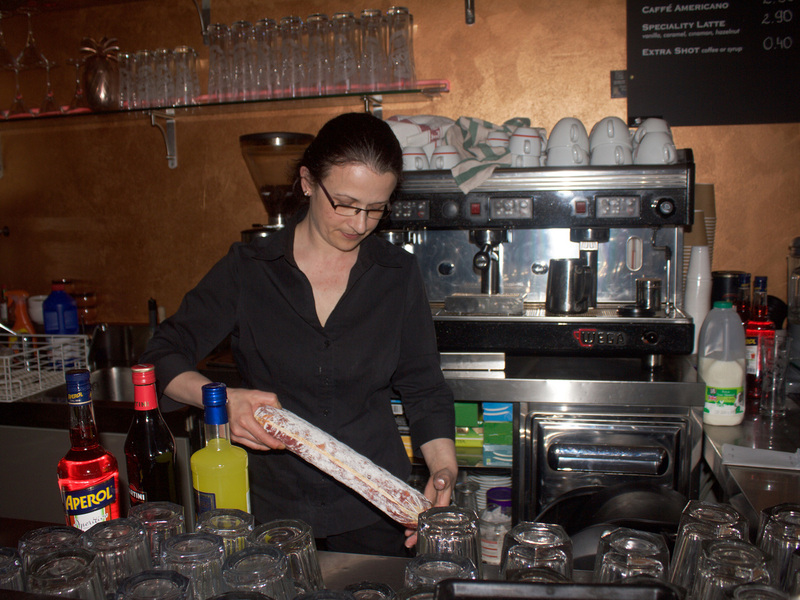 Anna Woydyla of Poland has lived in Britain for 11 years and works at a London restaurant. Many workers from EU countries are struggling with uncertainty about their future in Britain after the Brexit vote. Last month's vote by the United Kingdom to leave the European Union has left a lot of unanswered questions. One is what will happen to the 2.5 million EU residents who now work in the U.K. Many employers say sending them home would be a disaster for the British economy. Go into any store or restaurant in Greater London and the chances are good the people working there are from the EU. They teach in Britain's schools, pick its crops and build its houses. They're prominent in finance and medicine. "You can't go to a hospital now and get treated without the likelihood of some doctor or nurse being an EU migrant, so we're hugely reliant in many key sectors on the free movement of labor," says Seamus Nevin of the Institute of Directors, which represents employers. Britain didn't used to be a country of immigrants. But these days some 300,000 more people settle in the country each year than leave, says Madeleine Sumption, director of the Migration Observatory at Oxford. "There has been a lot of change in a relatively short period of time and the European Union has played quite an important role in this," she says. Sumption says EU membership allowed a lot of people to work in Britain without visas and immigration spiked after Poland and other Eastern European countries were admitted roughly a decade ago. More recently, a lot of people have come to Britain to escape the economic downturn in southern Europe. Twenty-two-year-old Raquel Gallego, who was sitting in Trafalgar Square not long ago, came from southern Spain to become an au pair. "In Spain there are no jobs and little opportunity, and I always liked London and England so it was just the moment to do it," she says. Gallego says she wants to settle in London and work with disabled children. Right now she can stay as long as she wants. But many people in Britain believe immigration is dragging down wages, especially for low-skilled work, and true or not those fears played a part in June's Brexit vote. The vote has left the status of foreign workers uncertain. Gallego's friend, Sanne Krukkert, who's from the Netherlands, says a lot of longtime immigrants she knows are considering leaving Britain. "I know a lot of people they are not feeling English anymore, and they're like for the first time ever I feel like I'm from a different country and I'm not from here anymore," Krukkert says. The British government has promised to protect the rights of EU immigrants who stay in the country. But Oxford's Sumption says it's not clear what that means or what kind of immigration controls will emerge. "I think it's very much conceivable that for new people who haven't got here yet there will be a fundamentally different set of policies and it will be much harder to come to the U.K.," she says. "For people who are already living here there is a much more complicated set of questions." How Will Brexit Affect London's Status As A Global Financial Center? One option is a points-based system that allows higher-skilled EU immigrants to remain in the country. There have also been reports that European officials are weighing whether to permit Britain to stay in the single market but allow it to bar new immigrants for up to seven years. Nevin, of the Institute of Directors, says the U.K. has to find a way to get immigration under control without closing itself off to the world. "It's important that the U.K. continues, as it has done throughout its history, to be an open economy that's outward facing and engaged with the world," he says. Nevin says Brexit was a wakeup call and the government can't afford to ignore it. But it has to do so knowing that EU labor has become essential in Britain — and that it's hard to imagine the economy without it.